File association with .nfc and .ndef files – opens the NDEF message directly in the tag composer. File contents automatically detected: complete NDEF message either as raw bytes or as hex string. Business Cards: import a contact from your address book or add all details you’d like to be included yourself. The contents are formatted according to the vCard standard and are therefore compatible to all other mobile devices. Social Network: enter the username / ID and choose the network to create a link to follow you. Available social networks: Twitter, LinkedIn, Facebook (website link and app launch), Xing, vKontakte, Foursquare, Google+. Creates a URI or Smart Poster, depending on if you add an optional title. Geo: choose target coordinates from the map or use the geocoding search. Supports Geo URI (RFC 5870), 6 different HERE maps schemes, the Bing Maps URI scheme, Nokia Maps links and a generic redirection script that enables Geo tags on various platforms, hosted at nfcinteractor.com*. Creates a URI or Smart Poster, depending on if you add an optional title. Launch Windows Phone 8 Settings: Launch WP8 settings pages from a tag, e.g., to activate flight mode or Bluetooth. Note that actually changing system settings is not allowed by the security model of Windows Phone. LaunchApp (3rd Party): Microsoft-defined format to directly launch an application by specifying its ID, optionally passing parameters. The ID of any Windows Phone-app can be automatically retrieved from the Store by NFC interactor. Supported on Windows 8 and Windows Phone 8. In contrast to the Windows Phone Proximity APIs, NFC interactor can create an app that contains multiple records (LaunchApp + others), to enable multi-platform app launching scenarios. 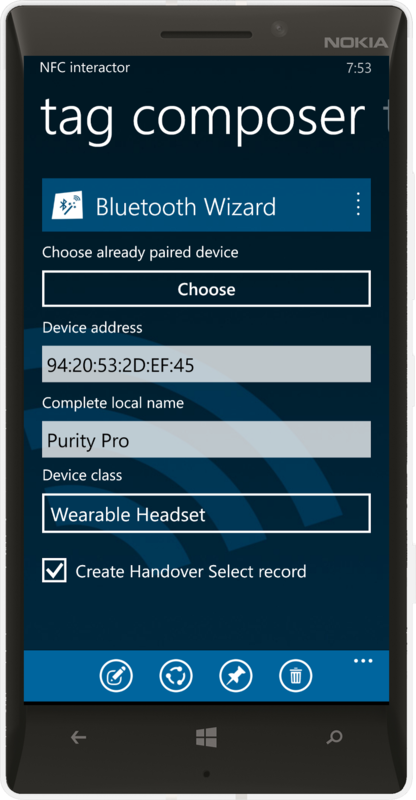 Bluetooth Wizard: easily create a Bluetooth connection handover NFC tag: select a previously paired Bluetooth device from a list, and NFC interactor automatically fills in the device address and name. Optionally set the device category, and your Bluetooth NFC tag is ready! 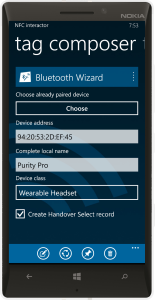 Bluetooth Secure Simple Pairing: low level editor of one of the most complex NDEF record formats – NFC interactor is the world’s only mobile app that allows full control over all details in the record, according to the latest Bluetooth 4.1 Core Specification. Handover Alternative Carrier: specifies the power state and links to a record with details about the carrier, e.g., the Bluetooth Secure Simple Pairing record. Handover Error: provides specific details in case a carrier is not currently available for connection handover. Android Application Record: directly launch an app on Google Android by specifying its package name. Supported on Android 4.0+. Nokia Accessories: write tags similar to those contained in various Nokia accessories, like the Nokia Wireless Charging Station or the Nokia Wireless Charging Car Holder, which launches the (otherwise inaccessible) Nokia Car App for simplified phone control in the car. Nokia Music Mix Radio: NFC interactor retrieves the currently available mixes online – pick one and write its ID to the tag to directly start the music with a tap. Spotify: write tags that launch Spotify and start playing a song / album / artist. Includes online search in the Spotify database to easily select your favourite. SMS: enter number and body to create a working SMS link, useful for example to request information services or for payment via SMS. Additionally, you can import the phone number from a contact in your address book. Creates a URI or Smart Poster, depending on if you add an optional title. Windows Phone doesn’t support SMS tags out of the box, but you can enable seamless support through the free NFCsms app. Mailto: send an email through an NFC tag, by defining recipient, subject and body text of the mail. It is also possible to import the email address from a contact of your address book. Telephone call: enter the phone number to call, and tapping the tag will immediatley bring up the phone dialer UI to allow the user to call the number. Additionally, you can import the phone number from a contact in your address book. NearSpeak: store voice messages on NFC tags, handled by the NearSpeak app. URI: automatically shortens URIs according to the specification to save tag space (e.g., won’t save “http://www.”, but encode that in a single byte). Text: set text and language. Custom: Choose the type name format and optionally add a type name and payload. Also useful for application autostart tags. Empty: can be used to delete a tag – the additional option to erase the tag will overwrite the complete writable tag memory area with random data, to remove all traces of the old message that was stored on the tag before. Send NDEF messages through the standardized SNEP (Simple NDEF Exchange Protocol) to other NFC devices, including for example Android 4.x+ or BlackBerry 10 phones. NDEF record classes for: Smart Poster, Geo location, Social Networks (Twitter, LinkedIn, Facebook, Xing, vKontakte, Foursquare, Skype), SMS, Telephone call, LaunchApp, Windows Phone 8 Settings, Android Application Record (AAR), Nokia Accessories, NearSpeak, Smart URI (depending on content requirements uses Smart Poster or URI to create the smallest possible message), Business Cards, Bluetooth and much more!